Gaming Mice: Grips, Behaviour & Motion Explained - Grip Styles and Mouse Type - Does it matter? Grip Styles and Mouse Type - Does it matter? Most gamers at some point will become interested in grip types especially when it comes to the first time they decide to drop a load of money on a fancy new mouse. At this point it wouldn't be fair to not reference Razer as they have spent a lot of money and time in the research of this area. It is generally accepted that palm grip makes up the majority of peoples grip choice, with around 25% of people opting for a claw grip and less than 20% are tip grippers. Though it would be an interesting question as to how people develop their own grip type depending on the games they play, the type of mouse they have bought and their seating/desktop position. 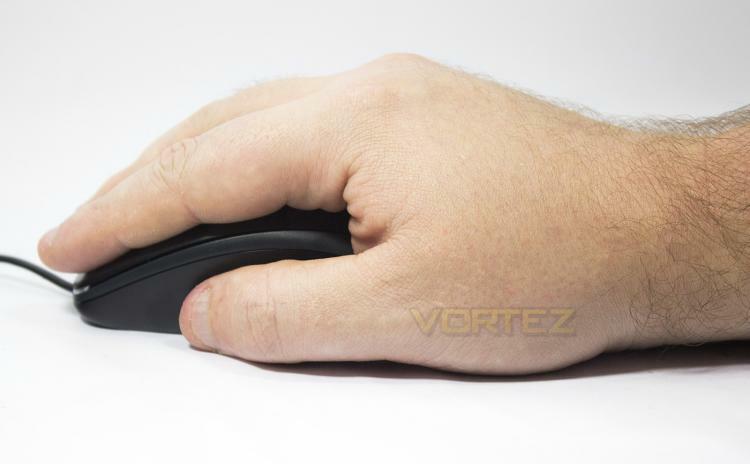 The palm grip is essentially a flat hand fully encapsulating the mouse. This grip type tends to be rather meticulous with high precision but is relatively slow and wooden in movement due to reliance on motion from the elbow and shoulder. 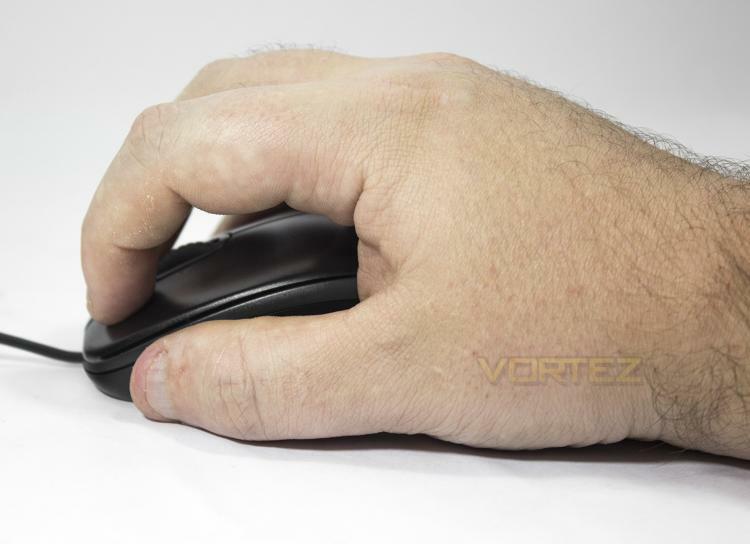 The Claw Grip has the fingers arched up, pushing the rear of the mouse into the base of your palm, thus having lower surface contact with the mouse. As demonstrated, this grip style is named after the claw like shape the hand adopts. The claw grip has become fairly common among pro-players in the esports scene as demonstrated here by EternaLEnVy and Dendi showing a claw grip, with Puppey using a palm grip in the background. This is due to the claw grip being able to provide more agile movement and a higher click rate. The tip grip is one of the rarest grip types and is notoriously difficult to master. Some may believe they are 'tip grippers' when they are merely a more centrally orientated claw gripper where the base of the palm doesn't meet the mouse. 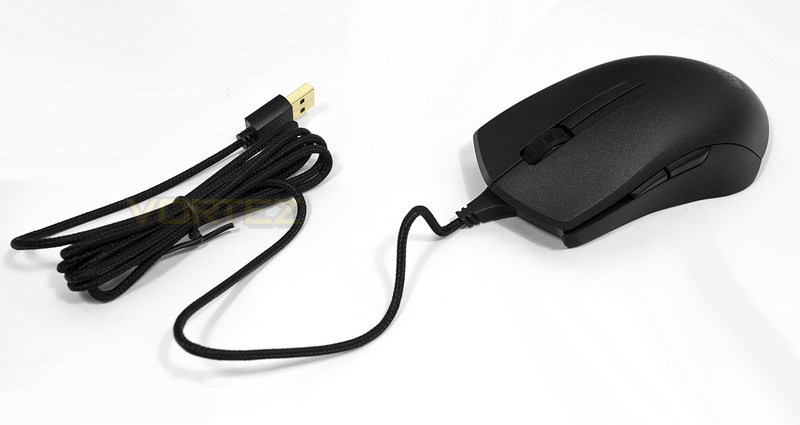 The true fingertip grip uses the very tips of the fingers to hold and move the mouse while using high sensitivities. Tip grippers often benefit from high speed and accuracy once mastered, but that 'mastered' bit is often the reason why people give up with this particular grip style. Certain games will benefit from different grip types and while it is best to stick with what you find comfortable, you only need to go to any click counter website to measure your click speed to notice that either your fingers will change towards a more claw-like position to increase click speed or your stubborn hand will start suffering some sort of fatigue from that full finger waggle. Though not all games require rapid clicks, especially where accuracy is more important. For example in CS:GO, you will see a variations of a palm, sometimes palm/claw hybrid being used along with low DPI settings and the whole arm resting on the desk with large and dynamic movements being employed (as seen here). So you may find your grip type vary between games, or you may simply have a preference, or your preference may simply have been dictated by the mouse you use. Gaming mice have slowed developed to cater for various grip types and their associated game genres. Some may even disagree with their classification, and so most manufacturers tend to opt for fairly 'safe' designs that cater for most grip types. Small sized mice - The Razer Orochi and Tt eSports Ventus R, are two good examples of small sized mice that are right up the street for finger tippers, though they aren't necessarily exclusive for people that finger tip, those that expect a good handful when holding their mouse may find difficulties with as such. Mid-sized mice - The mainstay of safe design where one size fits all. Often they feature subtle designs for comfort, but the more extreme shapes tend to cater more for palm grips while the more neutral shapes tend to be better for all. Honourable mentions here would be the Razer DeathAdder being the best selling gaming mouse of all time. Though, you can also see the difference between something like a CM Sentinel and the more neutral shaped CM Mastermouse Pro L.
Large/MMO mice - This category has been one of the largest growing sub-groups of mouse types in recent years, starting with the Razer Naga, the Logitech G600, ROCCAT NYTH, Corsair Scimitar and the ASUS ROG SPATHA. 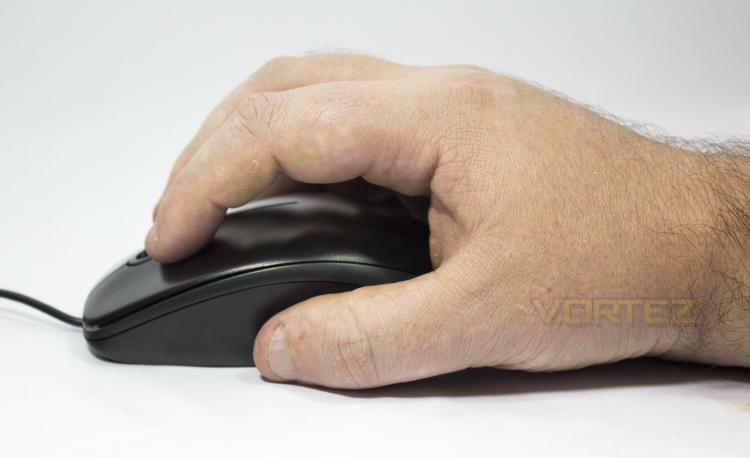 Most of the larger mice tend to offer full palm grip support with additional ergonomics for the whole hand. Though some aren't necessarily too heavy, or shaped too much as to limit use for the claw grip despite maybe a reduced accessibility to the multiple side buttons, finger tip grip however, is virtually ruled out due to size/weight. Some mice have tried to mix and match genres, such as the Razer Naga HEX which is a great mouse in its own right, but failed to tone down its size/weight and palm bias that could cause some discomfort for claw grippers (note the pointy rear end). So whether you prefer one grip type over another or a mouse type to another, your preference can often depend on your preferred game type. 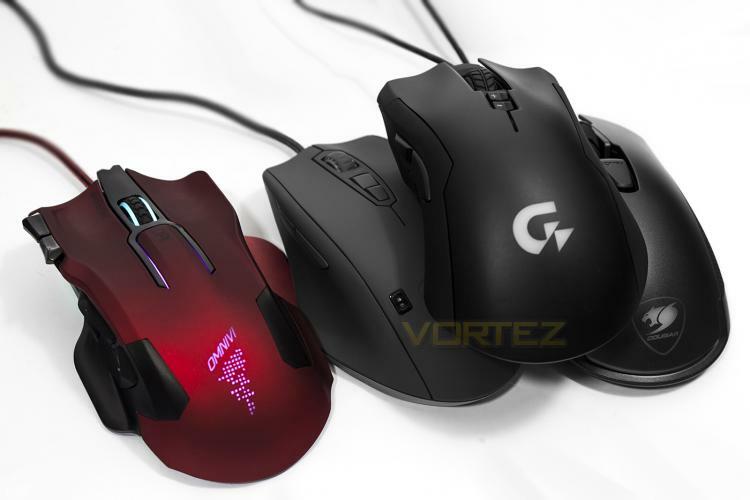 As many gamers don't tie themselves down to a specific genre, mid-sized, neutral-shaped mice are likely to be the firm favourite as they can pretty much do it all. The truth is, you are more likely to improve your performance through optimising your desktop seating/comfort and ergonomics than by consciously jumping between grip types that don't come natural to you. Remember, if you are experiencing any form of shoulder or wrist pain, take a break and maybe see a doctor. Carpel Tunnel Syndrome is real and it effects many people and is often exacerbated by poor seating/desktop positioning and comfort. Having a correct setup will reduce fatigue and improve your game and health.